I’m hoping in our collective memories that we get our priorities right. It is the things Winston Churchill said once that have more importance. Where’s my bust in the white house? Ok – it was a spoonerism. I meant to say you can’t see the clock for the pigs. I was looking at a pig covered clock at the time. The White House picks up on those kind of mistakes. That must be the reason. more times than Winston Churchill did in his life. I have never said “pass the butter.” as Churchill did every single day. I organise things better than Churchill. I have the butter near enough on the table relative to the length of my arms. I just have that kind of brain. Are you a better butter getter than Churchill or are you equally hopeless? This is more than a one-liner but it is Wednesday. Where did I put it? Read the headline twice. Does it have anything to do with being taller vertically than horizontally? 🙂 In reality it can’t have nothing to do with it…. I always make sure the butter is near me!!! The success quote is great-is it a Tim original? Via Winston Churchill, but Winston is dead so it doesn’t count. From the size of him, I’m guessing Winnie was a better butter getter than us all. I’ve heard he built brick walls as a hobby, do you suppose he used butter for mortar? Didn’t know that. Just know he drank with each meal and worked out with napping he got 3 days work for the price of two. Indeed… I’m a font of useless knowledge like that. I tend to be near the butter. I also tend to see failure as a stepping stone, albeit often to more failure, but sometimes to success, or more butter. 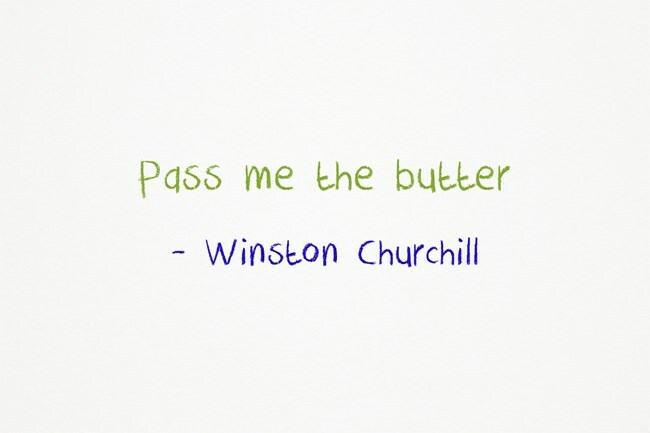 I understand that Churchill missed saying his infamous “pass the butter” every second Tuesday. He used the saved time to have extra power naps! 🙂 Or for drinking .. In true blonker form, I beat the drum with enthusiasm for more and better butter getting. Thanks for the laugh. I keep my butter in my pants pocket where it can do the most good. Good for emergencies. You can just slap it on the table. Then bring out the butter. Plus, it keeps my femur lubricated.